As if things could not any more nightmarish for the Ottawa Senators and their fans, another collective gasp was heard coming from the nation’s capital last night when Craig Anderson went down with what appeared to be a serious leg injury. Early in the 3rd period (with Ottawa up 1-0 on the New York Rangers), F Chris Kreider was tripped up and slid into Anderson, whose leg appeared to be bent in all kinds of uncomfortable and damaging ways. That was tough. I’m speaking, I’m sure, for a lot of the guys on the team when I say my heart sank into my stomach. When you’ve got one of the guys who is a large part of the heart and soul of the team and he has been playing so well, that’s just the luck we’ve been getting right now. In the end, Mika Zibanejad tied the game at 2 with a power play goal with 6.5 minutes left in the 3rd, and Kaspars Daugavins scored the shootout winner to give Ottawa a surprising and uplifting victory over the Rangers. Update on #Sens Craig Anderson: Craig has a sprained right ankle and is day-to-day. another 2 pts. #bish stood tall – hard place to come in the game. Love the #alfie save in the 1st! My ankle's gonna be ok, be back ASAP. Somewhat lost in all of this injury chaos is the fact that Ottawa has actually won 3 in a row, posting a record of 3-1 overall without Erik Karlsson. And on a larger scale, the Senators are 7–5-1 since Jason Spezza went down, and are defying all sense of logic by remaining in the Eastern Conference playoff picture despite losing their two star players (as well as Milan Michalek.) 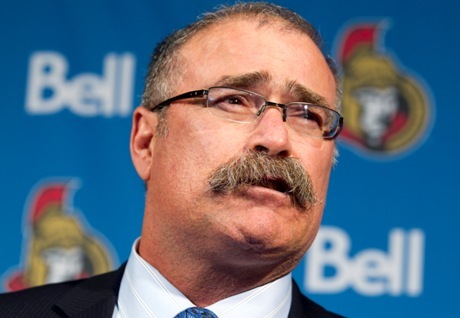 It’s quite a feat, and IF they can keep it up, coach Paul MacLean should not only be a lock for the Jack Adams, but might also garner a few Hart Trophy votes as well. Moving forward, the number of games missed by Craig Anderson could certainly go a long way in determining just how drastic a fall the Senators might be in for without their three best players (including two legitimate MVP candidates.) Having said that, Ottawa does have the distinct advantage of being able to promote Robin Lehner from Binghamton, one of the best goalies currently not playing in the NHL. With a record of 18-10-2, a 0.938 SV% and 2.12 GAA, Lehner does indeed appear to be more than ready to make the jump and answer the bell for an extended period of time, if necessary. And as the heir apparent to the crease in the long-term, all indications are that he’d be more than happy to grab the starting gig and never look back. As such, Senators fans don’t necessarily have to fret in terms of a huge drop off in net, and can go back to wallowing in the realities of life without Karlsson and Spezza. The Senators are back in action on Saturday night against the Toronto Maple Leafs, and then host the Montreal Canadiens before heading out on a 5-game road trip that begins next Thursday in Boston. These are 3 key games vs division rivals that could set the tone for the rest of the season.